As I continue in my tale, I must tell you what two moments that gave me the most pride and what event gave me the most excitement. At the first Gettysburg Remembrance Day programs that I attended on November 19, 2011, I experienced my first moment of great pride. After the portrayal of the Gettysburg Address and the keynote address by Stephen Lang (the actor who played General Pickett in the movie Gettysburg and General Stonewall Jackson in Gods and Generals), there was a ceremony to honor the two black Union soldiers buried in the Gettysburg National Cemetery. The keynote speaker for this program was Harriet Tubman as portrayed by Millicent Sparks. I must say that Ms. Sparks was magnificent as Harriet Tubman–in appearance, manner, and in speaking. Ms. Sparks was so powerful in her delivery and her description of the scene, it made us think we were in the presence of the real Harriett Tubman. Kevin Williams, a fellow 23rd member, and I remarked how inspirational it was to be in line and hear Harriet Tubman praise the USCT and how proud the African Americans in the crowd must have been as they heard her speak. Both Kevin and I shared the feeling that we had been transported back to a service just after the Civil War. The parade was magnificent, with thousands of reenactors for the Union army, and I would guess about a couple thousand Confederate reenactors. I had not seen that many reenactors in an event since I was at the 135th Gettysburg Battle Anniversary. When I passed by the Confederates and saw the long lines of Union soldiers, it was awe inspiring. The last program we participated in was the Lincoln Cemetery program to honor the thirty USCT buried in the black cemetery in Gettysburg. They were not allowed in the National Cemetery at that time, so this cemetery was created. All of the USCT still present took part in the program and were congratulated after the program. This one day made all of the money and time that I have spent pursuing this hobby worth it! The second moment of tremendous pride was marching in the Inaugural Parade. It is such a time consuming and arduous task to get into the parade once you have been invited. You have to go through security checks, where we had to send two or more pictures to the Secret Service at least a month before the parade. On the day of the parade, we had to meet offsite at 6:30 a.m. and get into two vans to be driven to the Pentagon–at a precise time period, not too much earlier than your time and not later than your scheduled time. We stayed at the Pentagon for a couple of hours. While there, we saw the 54th Massachusetts Co. A, and we had our weapons checked and did some drilling for the march. This was the first time as a group that we had even practiced for the parade. We were taken to the Mall into a huge tent where we were given lunch and could watch the Inauguration on large screen TVs. We did some more drilling and were put into line a little after 2 p.m. Then we proceeded to wait in line and inch our way to the start of the portion of the parade we were marching in. There were snipers on the tops of buildings, and we felt as if we were being closely watched because we had weapons. With all of the former military members and one policeman in our group, we knew that there had to be protection, but some of the guys wanted to make fun of the situation. We did not get to Pennsylvania Avenue until 5 p.m. When we finally started to march, we made a couple of mistakes during the first couple of blocks on Pennsylvania Avenue, but we were almost perfect going past the President. I think that I kept my salute a little too long, and one member had to be taken out of line after passing the Presidential box. We were so proud to see the President and First Lady stand and return our salute! Then we had to walk another mile just to get back to our vans. Almost every street and bridge was closed off in the area. We had to go into Georgetown to cross the Key Bridge to get back into Virginia to get back to our cars. It was 8:30 p.m. when we got back to our cars–a very long, but memorable day! This was a proud moment for me, as I was the third person in my family to march in an Inaugural parade. My mother marched in President Harry Truman’s parade, my niece marched in President Bill Clinton’s parade, and I marched in President Barack Obama’s parade! I had the most exciting time in my reenactment career when I fought with the 3rd US Regulars at the 150th Battle of Chancellorsville reenactment. We were told that there were about 5,000 reenactors for this battle. 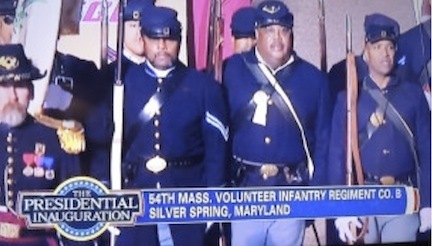 I marched with the 3rd, as we portrayed the XI Corps of the Army of the Potomac. Although there were no known black soldiers fighting in this battle, Kevin always fights with the 3rd at these battle reenactments, which are held at the Spotsylvania Court House field. Lou and I walked with him over to the Union lines, as the 23rd had a tent in the Living History section of the reenactment. We marched back to the field and Bryan Cheeseboro joined us, so the four of us were put in the front two lines in our company. There may be many pictures of me fighting in this reenactment–with my shiny IX corps badge on. Richard Chapman, a fellow seasonal historian at the Fredericksburg and Spotsylvania Military Park, was the narrator for the battle. He later told me that he saw me in the front lines of the army and had to laugh because there were no blacks in the original battle, and he saw four of us in the Union army that day. With so many reenactors on the field and everybody loading and firing and yelling and falling, it felt as if we were in a real battle. When I ran out of ammunition, Lou told me to fall wounded, and I did. Well, at the Battle of Chancellorsville, during Jackson’s flank attack, the XI Corps got overrun. However, at the reenactment as the Confederates walked around me, several asked if I was okay. Then a Confederate female nurse brought the wounded “Yankees” some ice cubes, so that we would not get too hot laying in the sun. I thought that they cared for us nicely. Most reenactors, whether Union or Confederate, black or white, are considerate of each other. Many white reenactors tell us that they are glad that we are here to tell the USCT side of the story. After it was over and we got back to our tent, I told all of our members, and the members of the Women of the American Civil War Era members, how much fun I had fighting in the battle. This entry was posted in Civil War Events, Common Soldier, USCT and tagged 23rd USCT, Henderson-memoir, reenacting, Steward Henderson, United States Colored Troops, USCT. Bookmark the permalink.